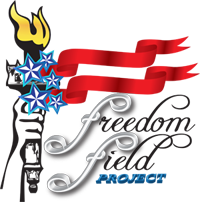 Flags of Freedom Monument: More than 300′ across, this centerpiece of Freedom Field Project will feature a 30′ x 50′ United States Flag flying more than 120′ above the ground, anchored in a 15′ high, five-sided granite base. 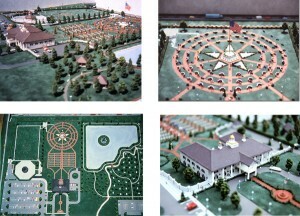 This base, including 5 pools forming the shape of a star, is encircled by three rings of Freedom Walk displaying all state and colonial flags and their history. Freedom Field Project: See Freedom Field Project from 1000′ above. After viewing the other links below you will be able to pick out each part of the Park and Museum. There are also many parts you will be able to see not discussed here. Republic Hall: a colonial styled building containing a wide array of flags, presidential and historic documents, memorabilia, history and evolution of the American Flag. Old Glory Garden: a beautiful floral arrangement of colored flowers displaying the American Flag in all its (natural) glory. Freedom Walk: An eight-foot wide sidewalk winding throughout the park paved with bricks imprinted with the names of each person, family, organization, company and corporation making specific contributions to Freedom Field Project. The walk will be mapped into sections so that contributors can easily locate their brick. Patriot Field: A parade ground bounded by a walk and flanked with flags representing many of the previous flags that have flown over the United States previous to Old Glory. Field of Honor: A salute to American Veterans, over one-hundred granite memorial markers, each bearing the names of major battles fought by Americans in the cause of Freedom, the number of men and women that lost their lives, the significance of the battle and where it was fought. You will see memorials commemorating Iwo Jima, Gettysburg, Bunker Hill, Battle of the Bulge and many others. Statue of Liberty: Symbolizing freedom, liberty and justice for all, this 85′ high replica of the Statue of Liberty sits on an island in the center of Liberty Pond. She will make an ideal background for 4th of July celebrations and other summer events and the pond will be idea for many winter activities.